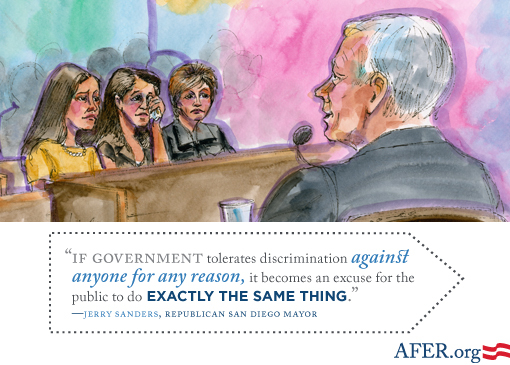 On the sixth day of trial, Mayor Jerry Sanders of San Diego, a Republican, testified about how he came to support marriage equality. In 2007, Mayor Sanders signed a city resolutions supporting the case that led to marriage equality in California. He gave an emotional speech about his journey. Then, University of Massachusetts Amherst economics professor M.V. 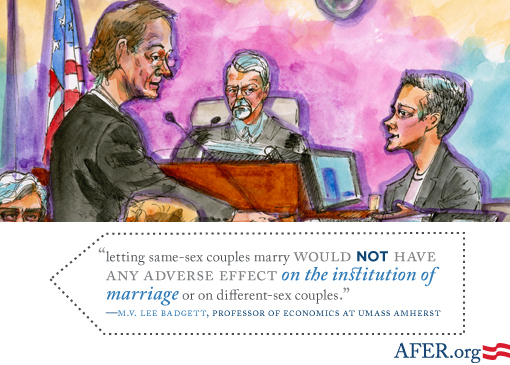 Lee Badgett testified about economic and demographic issues related the gay and lesbian couples and their children. Professor Badgett explained how Proposition 8 inflicts substantial economic harm on gay and lesbian families and the State of California and its local governments. She also testified that allowing gay and lesbian couples to marry would not have any adverse impact on heterosexual couples’ marriages.